Smithsonian objects conservator Dawn Wallace had spent more than 200 hours examining the Smithsonian’s pair and was intimately familiar with every detail. Wallace confirmed that the FBI’s pair was the real deal, but in a surprising turn of events revealed for the first time that the pair that had been in the museum’s possession since 1979 was mismatched. The left and right shoes were of different sizes. The heel caps and bows on each shoe were not identical. What’s more striking is that the FBI’s recovered pair had the same issues. When the four shoes were laid side by side, two identical pairs were temporarily united. The Smithsonian believes that the mix-up may have occurred in the run-up to a 1970 auction of MGM costumes and memorabilia. 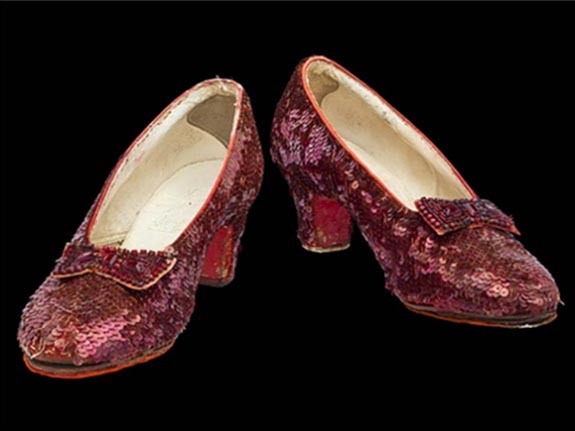 That’s when the Smithsonian’s pair was originally obtained and could have been confused with the other pair because all four shoes had felt bottoms and were intended for dance sequences.